How have I never heard of Biscoff? Yum! I can already tell I will spend the morning trying to find this locally…sorry work, tasty wins out! Happy Halloween and NaNo Eve! Thanks, Jennifer! Good luck locating the Biscoff. Try World Market if you have one locally. Also, maybe Trader Joe’s? Sadly, my little rurality has neither of those stores, but I think Walmart carries it – and there is an abundance of Walmarts in my neck o’ the woods! Nice! I hope you were able to find it. Let me know if you end up making the cookies… I hope you like them if you do! Love the pics. Happy Halloween! Happy Halloween to you too, Kirsten! I’ve never heard of Biscoff, but you had me at gingerbread. It’s entirely likely that we don’t get it here in Canada. We have a lot of what you folks get south of the border, but no usually any of the cool seasonal stuff and whatnot. I’m going to go on a mad hunt for this now. 🙂 Great pictures again, Katy! Nice to see you guys enjoying the season and Halloweeny goodness! Good luck finding the Biscoff, Jaime. You’ll have to let me know if you locate it. Happy Halloween! Thank you so much for sharing, Katy! 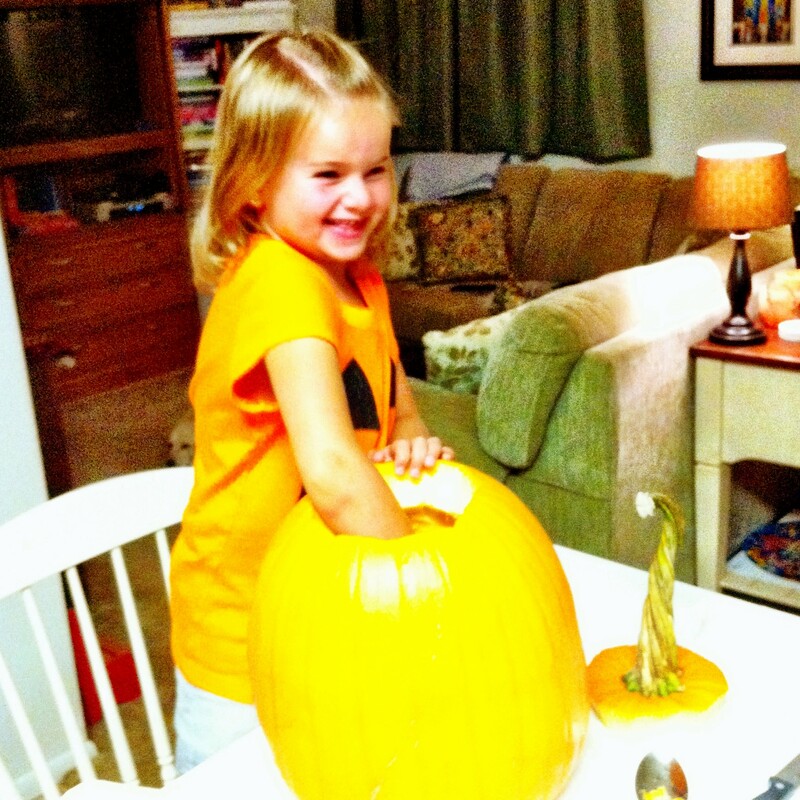 So fun to see you guys enjoying the fall and especially your sweet girlie 🙂 The look of glee on her face while carving the pumpkin is priceless! My four year old had that same look, until she actually felt those “guts”! She was a little shocked at how slimy they were, but she managed to get through it 🙂 Hope you have so much fun tonight! Pretty sure I had that same look on my face when I tucked into the new T-Swift album, lol. Your daughter is too cute. The corn maze looks cool! I’ve always wanted to try one. Halloween was going to be a no-go for me this year since I literally just got back from a fun but exhausting vacation last week. BUT then my coworkers decided to do a potluck and I found the perfect costume to be (wait for it) Taylor Swift! So I do get to join in on the fun – that and my sister bought our pup a shark costume. As for NaNo, I’m also last-minute jumping in. So NO, I am SO NOT prepared, but that’s what pantsing is all about right? Haha. Have fun Trick or Treating tonight! Hope we get to see your girl’s costume! I LOVE your costume idea! My girlie went through a brief phase where she wanted to be Taylor for Halloween. We were going to draw a thirteen on her hand and rock the red lipstick and all, but then she decided on Merida from Brave instead. I’ll definitely share a photo or two. 🙂 Happy Halloween! Then good luck to you too! Plotting is so tricky, but for me, totally worth it in the long run. Happy Halloween, Liz! Hope Halloween was fun, good luck with NaNo. Thanks, Alexa! Halloween was definitely a hit around here. Hope yours was great too! Looks like you had an awesome Halloween! And thanks for the cookie recipe; I love Biscoff! Yum. Thanks so much, Sophia! Are you NaNo-ing this year?